Don't hesitate to contact us by email or call us on +33 (0) 3 85 40 55 50 right now to book your next river cruise in Portugal. Portugal is not the only area available with alpha-croisiere.com. Discover all the other destinations of river cruise that we can rent you. 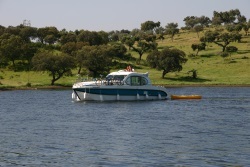 Rent with alpha-croisiere.com your boating holidays to enjoy one of our river and canal boats on Portuguese waterways. We offer the largest selection of barges on the market. Consult the list of all our river and canal boats available in Portugal to find the most suitable for you and contact us for more information. Your journey will take you across the Great Lake, or Grande Lago, formed when the Alqueva hydroelectric dam was constructed and now the largest artificial lake in Europe at 83km long with 1160km of shoreline and no locks, all of which makes it a paradise for those who really want to take it easy on their holiday. You can, of course, get to Amieira by car, taking advantage of Portugal's well developed road network, or indeed by air and then by coach. The Mediterranean climate, mild weather and almost constant sunshine mean that our centre at Amieira Marina is open for boat rental all year round. With its 1160km of shoreline, and thanks to the boat's sounder, you will have no trouble finding plenty of beaches on which to bathe in the warm and crystal-clear waters. There is also plenty to keep fishing enthusiasts, nature fans and those just looking to relax happy, too. Have you ever dreamed of living on a desert island? Well now your dream can come true. The rise in the water level in this mountainous region when the great lake was made resulted in the creation of a large number of islands, of which you might find you are the sole inhabitants should you choose to stop off here for a break, the evening, or even overnight. Local cuisine, wine, sunshine, easy living and a Mediterranean culture are what the region has come to be known for. Launched in 1968, the Alqueva Dam was finally inaugurated in 2004, its flooding resulting in the creation of Europe's largest artificial lake, spanning both Portuguese and Spanish land. Just like Atlantis, the town of Luz was engulfed when the great dam was flooded but was reconstructed identically with the help of funding from the Portuguese government and the European Union and is definitely worth a visit. 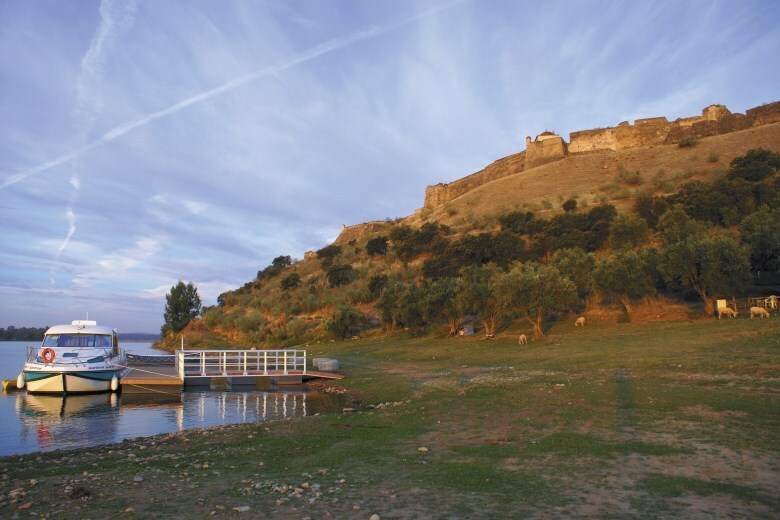 Disembark like a conqueror landing on its fine sandy beach before setting off to explore the fortified medieval town of Mourão, Who knows - you might even come across Prince Charming or Sleeping Beauty as you explore its Gothic castle. Monsaraz is one of the oldest and most interesting medieval towns in Portugal. Why not take a stroll around its paved narrow streets and admire the countless islands in the great lake from its battlements, and when you're feeling peckish, be sure to check out the local cuisine, which consists primarily of pork, lamb and game dishes.